For courses in critical care, acute care nursing, and as a supplemental text in advanced medical-surgical nursing. 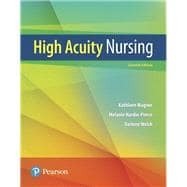 High-Acuity Nursing provides a comprehensive knowledge set needed to care for adult patients with complex, unpredictable conditions across settings, from high-skill, long-term facilities to critical care units. Focusing on the relationship between pathophysiology and the nursing process, the text encourages students to think critically to reach optimal clinical decisions for high-acuity patients. All chapters in the 7th edition have been updated and many have been reorganized and expanded. A new chapter focuses on palliative care and end-of-life issues, and new features address quality and safety, along with genetic considerations. High-Acuity Nursing, 7th Edition, is also available via Pearson eText, a simple-to-use, mobile, personalized reading experience that lets instructors connect with and motivate students — right in their eTextbook. Kathleen Wagner, EdD, MSN, RN, is now faculty emerita, having recently retired from the University of Kentucky College of Nursing after many years of teaching pathophysiology, pathopharmacology, and high-acuity nursing to undergraduate nursing students. She was also the educational consultant for the Undergraduate Nursing Program at the University of Kentucky. She has a doctorate in instructional systems design and continues to work on a team developing web-based clinical simulations for nursing students. Melanie Hardin-Pierce, DNP, RN, APRN, ACNP-BC, is a tenured associate professor in the University of Kentucky College of Nursing, where she has over 30 years of experience as a critical care nurse and has taught high-acuity nursing to undergraduate and graduate nursing students. She currently teaches in the Doctor of Nursing Practice program and is the Coordinator of the Adult Geriatric Acute Care Nurse Practitioner DNP Option. In addition to teaching, she has been active in curriculum development in both baccalaureate and graduate nursing programs. She earned her Doctor of Nursing Practice degree at the University of Kentucky, having studied oral health in mechanically ventilated patients. She is a board-certified acute care nurse practitioner who practices as a critical care intensivist in the Veterans Health Administration Medical Center, Cooper Drive Division, Lexington. She is active in research of critically ill, mechanically ventilated patients; evidence-based practice; and interdisciplinary collaboration. Darlene Welsh, PhD, MSN, RN, is Associate Professor, BSN Program Director, and Assistant Dean of Undergraduate Faculty Affairs at the University of Kentucky College of Nursing. Dr. Welsh earned a PhD in Educational Psychology and an MS in Nursing from the University of Kentucky. Her experiences in the care of critically ill patients include direct patient care, the conduct of research, and supervision of undergraduate and graduate students. Her research interests center on the provision of dietary instruction for patients with heart failure and interprofessional education for clinicians.